Dogs and children are often great playmates, but children may become upset if they're the recipient of an accidental nip. "Puppies and young dogs that get too rough while playing are normal," says Pam Reid, Ph.D, vice president of animal behavior at New York's ASPCA Animal Behavior Center. "They just don't yet realize that they're too rambunctious in their play with people. Once they learn that people are more fragile than other dogs, they temper their play." Your child can help enforce limits by reacting with a sharp "No!" when the dog gets too jumpy or mouthy, and by turning his back until the dog settles. It's also helpful if your child understands the difference between a playful pup and an aggressive dog. "A dog who's playing will be relaxed and loose in his movements: his tail will be relaxed & wagging, his face will look like he's having fun," Reid says. An aggressive dog's demeanor will be rigid and tense. "He'll probably freeze before nipping. His tail might be wagging, but it will be firm and stiff. His growl will sound more serious." Teach children that if they ever feel uncomfortable, they should slowly walk away from the dog, avoiding eye contact. "Avoid screaming, running, or flailing arms," Reid says. * The above information written by Debbie Swanson & taken from DogFancy Magazine - May, 2011 issue. While the threat of West Nile virus to dogs is small, the range of the illness in 2010 spread across the 48 contiguous United States and to British Columbia, Saskatchewan, and Ontario, Canada. Experts consider it to be a seasonal virus that flares in summer and continues into fall, roughly from May to October. 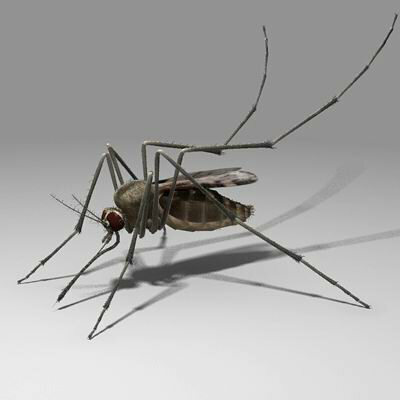 The virus, spread by mosquitoes, causes encephalitis - swelling of the brain. Symptoms in dogs include decreased appetite, difficulty walking and holding the head normally, circling, and tremors, according to the American Animal Hospital Association. However, dogs also may show no symptoms after infection, the Center for Disease Control and Prevention reports. 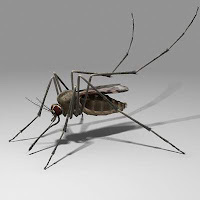 There is no specific treatment, and there is no documented evidence of dog-to-human transmission of West Nile. No vaccine exists against the virus. The prevention: avoidance. Keep dogs indoors in the early morning and the evening, when mosquitoes are most likely to be out, the AAHA says. Use only mosquito repellent approved for use on dogs - never DEET-based products, which can make dogs ill. Ask your veterinarian for recommendations. * The above taken from DogFancy magazine - May, 2011 issue. Poor puppy! Just when those 28 puppy teeth come in, those 42 adult teeth start clambering to the surface. You can help ease the pain - naturally. In addition to providing chew toys, putting ice chips in the water bowl, and massaging the gums, herbal remedies may also help. Chamomile can calm uncomfortable pups when the tea is given as a drink. Steep one teaspoon of dried herb in 8 ounces of water and let cool. Likewise, the homeopathic remedy Chamomile can be used, with a low potency, given two or three times per day. Try freezing aloe vera juice into cubes or in a paper cup that can be peeled away. Rub the frozen juice on your puppy's gums to ease irritation and banish pain. The teething stage lasts several months. Then, you'll need to be sure to hide the shoes from those brand new pearly whites. Affectionate children might not think twice about giving their favorite canine a great big hug. But parents should use good judgment before allowing such an embrace. 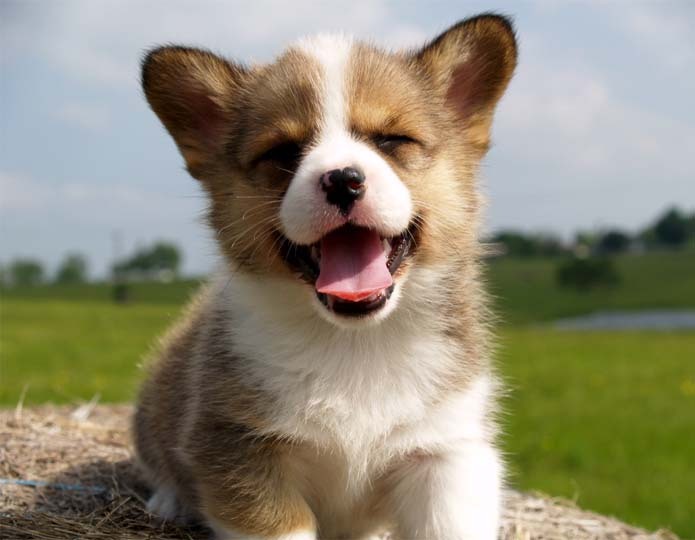 A toy breed could be injured by an overzealous hug, and a puppy or high-strung dog may act unpredictably or feel cornered by it. Some dogs interpret hugging as a sign of dominance. "Socialization plays a big part as well. If the dog is raised with the child and is used to human hugs, then I see no problem," says Jordan Buccola-Bautista, a behaviorist with the Louisiana SPCA. "A parent should always show a child how to be gentle, not to hold the dog against their will, and if [the dog is] struggling to get out of the hug, definitely let go!" says Buccola-Bautista, adding that children should never approach a dog if they are a stranger to it. 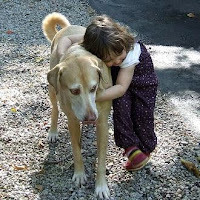 Because not all dog cozy up to a hug, teach children to display their affection with more dog-approved methods, such as a back scratch, gentle pat, or playtime. The dog in this picture is clearly not enjoying himself. His eyes are wide and he is stiffly leaning away from the child. Additionally, the dog is "tongue flicking", which is a sign of stress. The parents of this child should not be letting her hug this dog. * Above information taken from DogFancy magazine - March, 2011 issue. Independence Day is right around the corner. This is a pretty scary time for many of our four-legged friends. Fireworks can cause quite a bit of fright and anxiety. Accordingly, I thought this would be a good time to discuss a product called the Thundershirt. According to a veterinarian I saw on NBC (sorry guys - can't remember the vet's name), constant pressure on one's nervous system provides a soothing & calming effect. This is why babies are comforted through swaddling. It seems this is a rule that also applies to our canine friends. Thus is the basis of the Thundershirt. The product's website (www.thundershirt.com) claims: "Thundershirt’s gentle, constant pressure is a terrific solution for many types of dog anxiety, fearfulness, barking and more." Now, as a trainer, I am skeptical that the thundershirt alone can magically solve all of your dog's problems. However, I do recognize how the use of tools such as this one, are beneficial. And in connection with other training techniques, these tools can help to alleviate the symptoms that commonly accompany anxiety in dogs. 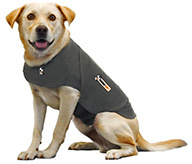 Have you used the Thundershirt for your dog? If so, I'd love to hear the results!